© Photograph by Will Burrard-Lucas An ultra-rare black leopard walks through Laikipia Wilderness Camp in central Kenya in 2018. The juvenile female was spotted traveling with a larger, normally colored leopard, presumed to be her mother. 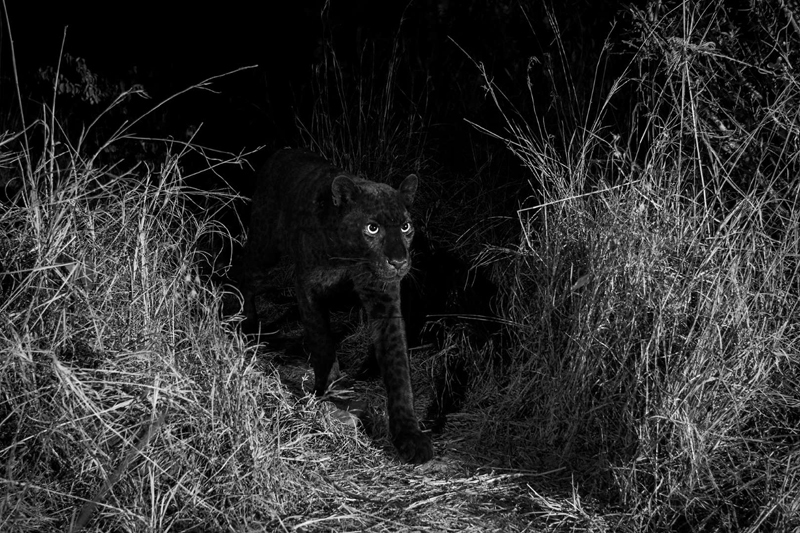 Its thought that melanism provides additional camouflage in those habitats, giving the predators an advantage when it comes to hunting, says Vincent Naude, leopard genetic forensics project coordinator for the nonprofit Panthera, who was not involved with this research. "Our leopards live in savannah-type environments, so having that extra melanism doesn't give them an adaptive advantage," says Naude. Even still, given their nocturnal lifestyle, a bit of additional pigmentation certainly doesn't hurt.